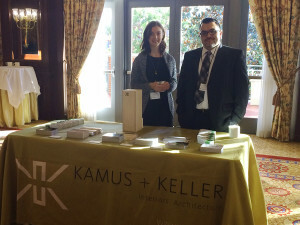 Kamus + Keller came out Friday morning to support and sponsor the 19th Annual CBRE Ventura County & Conejo Valley Commercial Real Estate Symposium and 2015 Economic Forecast held at the Four Seasons – Westlake Village. Attendees heard from industry experts from multiple sectors as they predicted outcomes for the coming year. Following welcome and introductions from David Josker, (Managing Director, CBRE Ventura County and LA North), speakers included Mark Perry (Senior Vice President, CBRE Private Client Group), Capital Markets; Tom Dwyer (Senior Vice President) Office; David Rush (Senior Vice President) Retail; Paul Farry (Senior Vice President) Industrial; and keynote speaker and economic expert Dr. Mark Schniepp (Director, California Economic Forecast Project). Dr. Mark Schniepp gave a thorough and entertaining economic forecast while boldly declaring that, “The recovery is now over. The economies of the nation, state, and region are now in the expansion phase of the business cycle.” Phew… things are looking up and 2015 is going to be a great year!